Bold new graphics provide a powerful new look for this proven performer. The 565 sterndrive combines the proven performance of big block power with the creature comforts of digital throttle and shift. A stroked, 8.7 liter cylinder block combined with high-performance cylinder heads, multiport fuel injection and twin electronic throttle bodies results in a whopping 565 horsepower at the 5000-5400 rpm operating range. 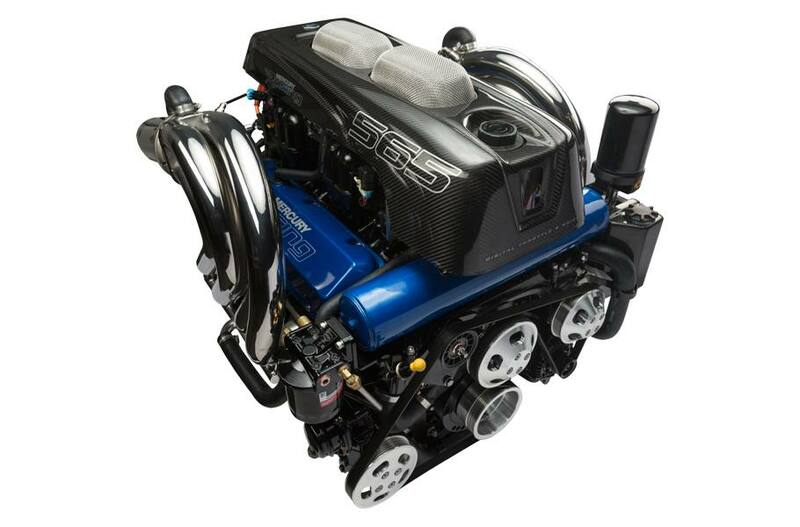 All of this power comes from 89 posted octane fuel; making this naturally aspirated powerhouse a natural for high performance vee-bottoms and catamarans as well as sport cruisers. The 565 is backed by a 2-year factory warranty. Torque: The stroked 8.7 liter V8 engine provides unmatched low-end and mid-range punch to get you where you want to go…FAST! *Integrated Transom System Optional. Weight is based on lightest available engine package (engine, transom plate and drive).